King Aerivar XVIII. The sovereign of Aerie (a division of Attilan populated by winged Inhumans that seceded from the city centuries ago). Aerivar ruled Aerie in the 1920’s, at the time that an airplane from human world had accidentally come across the hidden floating city and crash landed. The only survivor of this crash was a human infant. Aerivar decreed that this child would be raised as one of their own. As the child grew older, Aerivar had a flying harness and set of artificial wings made for him so that he might fly alongside his fellow citizens of Aerie. This child grew up to become the World War II-era hero, Red Raven. The father of Black Bolt and Maximus, son of Symak, and husband of Rynda. Agon became the king of Attilan after his father passed away. He was viewed by his people as a fair and just king and Attilan enjoyed a long period of peace and prosperity under his rule. Agon was a brilliant scientist and geneticist. He was elected Chancellor of The Genetic Council circa 1870 and ruled as both king and head of the council. It was during his time as Chancellor that Agon banished Phaedar and outlawed the science of cloning on Attilan. The exact nature of Agon’s Inhuman powers were never revealed. He appeared essentially human-like and, other than his great intellect, he never demonstrated any supernatural abilities. Keenly interested in expanding the potential effects of Terrigenesis, Agon subjected his son, Blackgarr to the Terrigen Mists when he was still in his mother’s womb. This resulted in Blackgarr’s being born with his Inhuman powers already in bloom. Agon was later killed in an accident that was the result of Black Bolt’s efforts to stop a group of Kree assassins. Agon’s death ultimately led to Black Bolts ascension to the throne. Ahura ‘Pope’ Boltagon. The son of Black Bolt and Medusa and prince to the throne of Attilan. Ahura has had a very difficult time in his young life thus far. He was conceived shortly after Attilan had relocated to the blue area of the moon, during a time in which The Genetic Council held significant power over the governing of Attilan. The announcement of Medusa’s pregnancy caused a great stir among The Council. With the dire potential for destruction entailed in Black Bolt’s powers, couple with the madness of his brother, Maximus, the council decided that a child sired by Black Bolt poised far too dangerous a threat to Attilan. The Council ruled that Medusa had to terminate her pregnancy. Black Bolt seemed to feel a great deal of conflict over the matter, whether or not to heed to The Council’s ruling. Medusa felt no such conflict and she absconded to Earth so to protect her unborn child. Assisted by her sister, Crystal, along with Minxi, Gorgon, Karnak, and Triton, Medusa was able to remain hidden. She gave birth to a healthy baby boy whom she named Ahura. When Black Bolt finally discovered his wife’s whereabouts he was not upset or angry, but rather overjoyed to meet his son. They all returned to Attilan, where The Council reluctantly conceded that infant was not an overt threat to the wellbeing of Attilan. So to insure that whatever powers and abilities the child might manifest would not prove a risk, The Council insisted that his care be entrusted to the mysterious ‘Pacifiers’ (a sub-sect of the clergy who had trained Black Bolt to exert total control over his powers). Although he had yet to be subjected to the Terrigen Mists, Ahura had nonetheless manifested Inhuman powers (suggesting that Ahura may be both a Mutant as well as an Inhuman). These powers were psychic in nature, entailing an ability to read and affect the emotions of others as well as a telepathic ‘evil eye’ – a glare that focuses his powers into a single, lethal blast. Ahura accidentally killed a farm animal with this ‘evil eye.’ He hadn’t realized he possessed such a power and was horrified by this accident. The event was witnessed by a local who convinced the rest of the townsfolk that this youngster was a demonic presence. Meanwhile, Medusa had discovered Kitang’s plot to have Ahura sent away and she dispatched Gorgon and Karnak to go to Earth and retrieve him. A demonic entity known as Blackheart (an old Ghost Rider villain) had become aware of Ahura’s power and sought to possess him. Gorgon and Karnak, along with the hero, Daredevil, interceded and managed to save Ahura from Blackheart’s clutches. Ahura was brought back to Attilan and reunited with his parents. Some time thereafter, the villainous Inhuman known as Arcadius attempted to take control of Ahura’s budding powers as part of an effort to conquer Attilan and dethrone Black Bolt. Arcadius’ plot was thwarted with the assistance of The Fantastic Four. Ahura appeared to be traumatized by the experience and he was again placed int he care of The Pacifiers. His experiences of trauma, coupled with the difficulty he had learning to control his psychic powers, led Ahura to be misidentified as suffering from a psychotic illness. The Pacifiers kept Ahura in a near-cationic state. Medusa would visit her son frequently, yet he hardly recognized her. Ahura’s uncle, Maximus, coerced his niece, Luna, to use her own powers to remove the mental shackles that the Pacifiers had placed on Ahura’s mind. Maximus convinced Ahura that his parents had abandoned him and that he should assist his uncle in his efforts to dethrone Black Bolt. Ahura agreed and he used his abilities to augment Maximus’ own psychic powers, enhancing Maximus’ power to control the will of others by a significant margin. This allowed Maximus to claim the throne as his own and he actually ruled Attilan for a good deal of time with his nephew at his side. Maximus’ rule came to an abrupt end during the Secret Invasion event where it was discovered that Black Bolt had been abducted and replaced with a Super Skrull imposter. The Inhumans rallied around Medusa in the battle to repeal the Skrull invasion of Attilan. Ahura was taken prisoner by one of the Super Skrulls during the attack and absconded away to the spacecraft where his father was being held prisoner. The Skrulls had hoped to use Ahura’s presence as a means of coercing Black Bolt to relinquish his secrets and enable the creation of Super Skrulls who could fully replicate his awesome sonic powers. Yet this strategy proved to be a costly error on the part of The Skrulls. Ahura was able to work through his fears and his feelings of anger toward his father and utilize his powers to force the Skrull scientist to free Black Bolt from his imprisonment. Once freed, Black Bolt made quick work of the remainder of The Skrulls, destroying all that was left of their armada. Later, Ahura became a student at the Future Foundation and he had numerous adventures alongside the FF. Ahura had better refined his psychic abilities and could even manage telepathic communication with his father. The use of a specialized suite enable Ahura to re-channel his telepathic powers into telekinetic abilities, affording his the ability for levitation and flight. Ahura made good friends among his fellow students at the Future Foundation. He was especially close with Alex Powers and there was even a bit of a romantic crush between him and the brilliant transfer student from Wakanda, Onome. Through his involvement with the secretive Illuminati, Black Bolt had come to learn that all of reality was collapsing in on itself in a slow cascade of inter-dimensional incursions. The Illuminati and The Avengers had come to realize that they could not prevent this terrible fate and they altered their strategy from attempting to save the world to creating a small trans-dimensional lifeboat of sorts to rescue just a small portion of the human race. There was no room for Inhumans on this lifeboat and Black Bolt was forced to take drastic actions of his own. He took Ahura to the nefarious Kang the Conquerer and offered his son to Kang in exchange for the promise that the villain would take Ahura to a point in the time-stream where he would be safe from the inter-dimensional incursions. 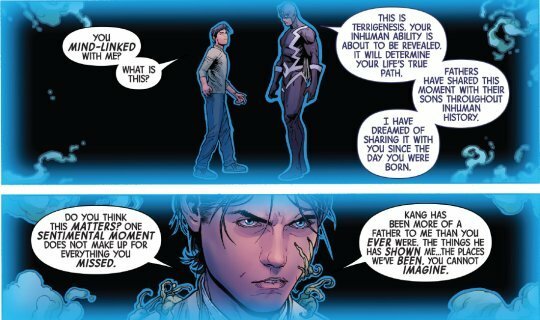 Kang agreed and before Back Bolt left his son he exposed him to a vial of Terrigen Mist, triggering Ahura’s Terrigenesis.In the wake of Secret Wars, Black Bolt attempted to retrieve Ahura from Kang. He was unsuccessful and Kang set Ahura off on a mission to destroy the Inhumans. Kang trained Ahura to be a great warrior, pitting him against opponent after opponents throughout the time-stream. As time went by, Ahura came tor realize that the various individuals he was fighting and destroying were each the ancient relatives of the Inhuman peoples; that by killing these opponents he was actually eradicating The Inhumans from history. This realization had come too late and Ahura accepted what he had become. He killed Kang and took on his mantle, becoming the new conquerer of time. Some two hundred years later his whereabouts were ultimately discovered by his parents. Black Bolt had finally explained to Medusa what had become of their son. Medusa assembled her new team of Uncanny Inhumans. By then the effects of what Ahura had been doing in the past were manifesting in the present as all of the Inhumans were quickly being nullified from history. Utilizing Hank McCoy’s knowledge of time travel, coupled with the abilities of the Inhuman, Reader, the Uncanny Team was able to escape into the time-stream and track down Kang. And yet the Kang they found was actually an older and greatly embittered Ahura. Following a tremendous battle, Ahura ultimately forced Black Bolt to destroy him… a last act of revenge, forcing a father to kill his own son. So to save Ahura as well as all of the Inhumans who had been eradicated, the Uncanny Team then traveled back in history to the point where Ahura first emerged from Terrigenesis. Kang was expecting this betrayal and he returned with his army to take on The Uncanny Inhumans. The ensuing battle resulted in a standoff between Black Bolt and Kang, with Kang holding a seemingly defenseless Ahura in his grasp. Yet it turned out that Ahura was not as helpless as he had appeared. Terrigenesis had awaken greater power in Ahura… what appears to be a significant amplification of his psychic abilities. He gained the power to astral project, create multiple copies of himself, as well as a much more potent capacity for mind control. He was able to rip through Kang’s psychic defenses and take absolute control of his will. He forced Kang to retreat, adding that, were he to ever consider trying to take revenge on the Inhumans again, he would be affected by an unyielding compulsion to kill himself. It is not clear what all this will mean for Ahura moving forward. He has become significantly more powerful, but also possibly more unbalanced and psychologically scarred. More recently, Ahura staged a coop within the ranks of the Ennilux Corporation, earning himself the place as the conglomerate’s chief executive officer. Aireo: Aireo (also known as Skybreaker) is an Inhuman with levitation and flying powers. He is a former member of Maximus’s allies and was involved in a number of Maximus’ schemes to claim his brother’s throne. Aireo was banished from Attilan following one these failed coups. He later returned and attempted to steal the royal scepter so to sell it on the black market. Aireo was foiled in this scheme by Luna’s then-husband, Quicksilver. He later joined the ‘Force of Nature’ super team as part of the Initiative Act following the Super Hero Civil War. Aiero was stationed in the state of Oregon and he took on the name ‘Skybreaker’ in his new role as an Initiative Hero. Aiero has not been seen in a long while and his current status and whereabouts remain unknown, but it is possible that he is still residing somewhere in Oregon. An Inhuman from the Marvel Cinematic Universe. Alisha has the ability to create multiple copies of herself who act autonomously but in accordance to her singular will. She was a member of Jinjiang’s inner circle and participated in the attempt to destroy SHIELD. She was incapacitated by Lincoln’s electrical abilities and was taken into custody bySHIELD. Alisha later assisted the agents of SHIELD in tracking down Inhumans who were being hunted by the villainous Lash. Her current status and whereabouts remain unrevealed. The character of Alisha is portrayed by actress and stunt-person, Alicia Vela-Bailey, who also acts as the stunt double for Adrianne Palicki’s character, Mockingbird, as well as Bridget Regan’s stunt double on the show, Agent Carter. The current Queen of the Badoons and ceremonial bride of Black Bolt. Aladi is a Universal Inhuman, one of a number of different alien species whom the Kree had subjected to the same Terrigenic experiments as Earth’s Inhumans. As part of a Celestial Prophecy, the regents of these diverse cosmic Inhumans came together and chose Black Bolt as their king and leader. Medusa was none too pleased with having to share her husband with several new wives, but it was implied that the marriages between Black Bolt and his Universal Queens were strictly ceremonial and not a matter that was consummated (or at least I hope that was the case). Black Bolt disbanded The Court of The Universal Inhumans once the Kree were defeated and their invasion of Earth repelled. The marriage between Black Bolt and Aladi was annulled and Aladi and her fellow queens returned to their respective home-worlds to govern over their peoples. Albakor: An aquatic Inhuman with green, scaled skin and fish-like features. Albakor was promoted to the Inhuman Elite (a branch of the Royal Guard that battled the Shi’Ar during the War of The Kings event). As one of the few aquatic-based Inhumans, Albakor was especially well suited for zero-gravity combat and he (along with Triton and Dorhun) excelled as a warrior in outer space settings. Albakor is additionally a skilled scientist, well versed in the properties of the Terrigen Crystals. He oversaw the cultivation and maintenance of the crystals during the time that Attilan was situated on the Kree planet of Kon-Tar. His current whereabouts has yet to be revealed. A member of the younger generation of Inhumans as well as a soldier in the Royal Guard. Alaris possesses enhanced strength and bulletproof skin. He was sent to Earth as part of a reconnaissance mission/student exchange program. Alaris enjoyed his experiences on earth, although it frequently seemed that his naiveté toward earthly culture led him to mocked and taken advantage by his human peers. Alaris even found himself in the odd position of acting as the school mascot for the University of Wisconsin (much to his fellow Inhumans’ chagrin). Alaris has returned to the Royal Guard with the establishment of New Attilan on the Hudson Bay. He was most recently seen taking part in a raid of an AIM facility where the evil scientists were hoarding the unhatched cocoons of a group of new Inhumans. The daughter of Gorgon and a yet to be named Inhuman mother. Alecto possesses enhanced reflexes and the ability to fly by way of a pair of bat-like wings that can grow and retract from her back. Alecto was groomed by her father from a young age to be a fighter, to ultimately serve alongside him in the Royal Guard. Countless guardsmen had been trained by Gorgon and it was a point of pride that his daughter would prove his greatest pupil. It was extremely difficult for Alecto to cope with the extreme pressure hoisted unto her. Needing a break from her taskmaster father, Alecto often sought out a quiet place to be by herself in the labyrinth of tunnels underneath Attilan. Subterranean Attilan had been the realm of the Alpha Primitives, the cloned beings who had once been a slave caste toiling in the mechanical underbelly of the city. These beings had previously been sexless drones who reproduced strictly through cloning. Once Black Bolt had abolished the practice of slavery on Attilan and freed The Alphas, the creation of new clones ceased. Subsequently, the number of Alpha began to gradually diminish. Somehow this led to a mutation among the younger generation of Alphas and they developed sexual characteristics as well as the ability to reproduce via procreation. Alecto encountered one of these younger Alphas. His name was Reyno and the two youths quickly struck up a close friendship. As time went by, Alecto and Reyno fell in love. Alecto’s father came to learn of this relationship and he forbade his daughter from being with Reyno. Alecto and Reyno ran away. They stole a spacecraft and traveled from the Moon down to The Baxter Building in Manhattan, where they asked for amnesty among the Fantastic Four. Gorgon pursued his daughter to Earth and tried to take his daughter back by force. The Fantastic Four stopped him and tried to work the matter out in a more diplomatic fashion. There were some tense moments where Reed Richards and Sue Storm considered whether or not to offer protection to Alecto and Reyno. In that the two Inhumans were still technically minors and neither had actually being abused, Reed ultimately decided to hand Alecto back to her father, noting that it was not their right to tell a parent how to raise his child. Reed’s wife, Sue, very much disagreed with this decision, but she reluctantly stood by her husband’s side on the matter. It was a very sad affair. Shortly thereafter, Alecto appeared to have a change of heart, deciding to end her relationship with Reyno and adhere to the more traditional customs of Attilan. She joined the royal guard and told Reyno that she no longer wished to see or speak with him. Some time later, Alecto and Reyno rekindled their romance. King Black Bolt had offered the relationship his blessings and provided the two a plot of land on the outskirts of Attilan where they could live in peace, safe from the angry Inhumans and Alpha Primitives who so vehemently opposed their union. What has since become of both Reyno and Alecto has yet to be told. It is possible that they remained on the blue area of the moon when Attilan relocated and that they are continuing to live their together. Ambur Amaquelin. An Inhuman who is the mother of Medusa and Crystal. Ambur is also the sister of Azur, the mother of Karnak and Triton. Not much else is known about Ambur. She is mentioned on several occasions, but her only appearance on page was in the story, ‘Thrones’ from Women of Marvel One-Shot. Andvari: An Inhuman engineer who designed and operated the massive anti-gravity technology utilized to relocate Attilan from the coast of South America to the Himalayan Mountains. It’s a fair assumption that Andvari was also involved in the secondary relocation, when Attilan moved to the Blue Area of The Moon. Thus far, Andvari has only made one appearance, in the pages of What If Vol. #29. An Inhuman who has thus far only appeared in the Marvel Cinematic Universe in the television show, Agents of Shield. Androvich was a former assassin for the KGB and later promoted to the position of Minister of Defense of the Russian government. Androvich allied with the Hydra over-boss, Gideon Malick as part of a conspiracy to murder the Russian Prime Minister, Dimitri Olshenko. Androvich’s Inhuman abilities enabled him to manifesting his shadow into a DarkForce-powered being that can change its density at will. The plot was ultimately foiled by the renegade Shield Agents, Bobbi Mores and Lance Hunter. Androvich was killed by Bobbi Morse. His character was portrayed by actor, Kristof Konrad. An Inhuman from a possible future timeline depicted in the pages Guardians of The Galaxy Vol. 1 (Earth 691). In this future timeline, Loki had conquered all of Attilan and utilized the Inhuman populace so to create gladiators to fight for his amusement. Anemone was one such gladiator and he possessed a paralyzing touch that could incapacitate any who came into contact with. Anemone also possessed a series of tentacles exuding from his back each of which could also emit this paralyzing touch. The Inhuman fell during one of Loki’s gladiatorial games and it is presumed that he perished in the fight. Arkadine Arcadius. An elder Inhuman who was the former Chancellor of the Genetic Council. Terri genesis endowed Arcadius with the ability to animate stone statues and use them as extensions of his will. Arcadius became Chancellor of The Genetic Council following the departure of its former Chancellor, Kitang. Arcadius managed to unseat many of the other members of the council and fill their positions with his cronies. This occurred during a time in which Black Bolt and the rest of The Royal Family were temporarily deposed from Attilan and all this made Arcadius in essence the ruler of the Inhumans. A phenomenon occurring in the citadel of The Watcher created a space-time vacuum on the moon that threatened to destroy Attilan. Unable to devise a strategy to address this crisis, Arcadius chose to evacuate the city with the Terrigen Crystals and the other members of the council, leaving the rest of the population to perish. Arcadius had hoped to use the recently emerged continent of Atlantis as a new home on which to recreate the Inhuman race, with him as its supreme leader. Fortunately, The Fantastic Four were able to intercede and they saved Attilan. Arcadius was betrayed by his ally, Morgan Le Fey and the Genetic Council were killed when Atlantis sank back beneath the waves. Arcadius managed to escape and absconded away to places unknown. The Inhuman later returned with a new plot to murder Black Bolt and the rest of the Royal Family. An adventure had brought the family to Manhattan where Arcadius had detected their presence. He then used his powers to animate several statues around Central Park, willing the statues to attack. Not willing to unleash his sonic abilities in the heart of a populated city, Black Bolt was unable to assist and it seemed for a moment that Arcadius was going to prove victorious. The timely arrival of Crystal and Quicksilver turned the tide and the heroes were able to defeat the statues. Arcadius had stretched his abilities too far in animating so many statues; he endured a massive wave of feedback when the statues were destroyed and it appears as though he died when the last of his statues was destroyed. A Centaurian and Universal Inhuman who acted as the adviser to Queen Oola Udonta. The Universal Inhumans were made up of several different alien species that the Kree had subjected to the same Terrigenic experiments as Earth’s Inhumans. Arris possesses telepathic abilities. When one of the Council of Alternate Reality Reed Richards came to the Court of The Universal Inhumans to ask permission to conduct an archeological expedition on the Blue Area of the Moon, Arris was able to detect that he was lying and that the Council of Alternate Reality Reed Richards had plans to sacrifice the 616 version of reality. Upon Arris’ declaration that this version of Reed Richards was lying, Avoe, Queen of The Dire Wraiths, attack and killed this Richards, absorbing his consciousness and providing the Court of The Universal Inhumans with the information that ultimately caused them to align alongside The FF in opposing the Council of Alternate Reality Reed Richards. Once Black Bolt dissolved the Court of The Universal Inhumans, Arris returned with his queen to the Centaurian home world. A sergeant among the defensive security force of Attilan. Similar to his cousin, Stalor, Arvak possesses a centaur form, with the body of a horse and the head and torso of a human. Along with being chief of the night-watch, Arvak was also responsible for training new recruits who had been assigned to the defensive security force. Although he was a stalwart guardian, Arvak was unable to martial an effective defense against the surprise Kree invasion led by Ronan The Accuser. Having successfully conquered Attilan and defeated its king, Black Bolt, Ronan transformed the city into a space-faring craft to be used as a weapon in the Kree’s war with The Shi’ar Empire. Once Black Bolt was ultimately able to defeat Ronan and free The Inhumans, Arvak stood with the majority of Attilan in deciding not to return to Earth and remain a space-fairing people. Attilan eventually returned to Earth, but Arvak has not been seen again. His fate and current whereabouts remain unknown. An Inhuman who had green skin, reptilian features and bat-like wings. Asmodeus served as a member of Stalor’s security force. He was also among a group of Inhumans who battled the Fantastic Four in Brooklyn. Asmodeus was later promoted to the Royal Guard and patrolled the skies above Attilan, vigilant for any sign of a threat against the city. His current whereabouts following the fall of Attilan during the Infinity Event remain unknown. An Inhuman with red skin and feline features. Ata was a member of the Royal Guard and assigned to patrol the prisoner banks below the city. She and a fellow sentry came across Maximus who had just freed himself from one of the cells. Maximus used his telepathic abilities to force Ata and the other guard to attack one another. Maximus made good with his escape as Ata and the other guard tried to tear each other to shreds. It remains unknown whether or not Ata survived. General Ator. The leader of The Crimson Cadre, a specialized branch of the Royal Guard reserved for extremely dangerous operations. Ator possesses augmented strength, speed, and intellect. The Crimson Cadre was formed during a time in which Black Bolt and the Royal Family were deposed from Attilan and the Inhumans were ruled by Chancellor Arcadius and the Genetic Council. Arcadius created the Cadre to cement his rule and put down any dissension among the Inhumans over his leadership. Ator had previously been a captain among the Royal Guard and presumedly Arcadius recruited him because of his skill and extreme loyalty to service. Ator and his Crimson Cadre unit played a significant role in the Atlantis Rising storyline, where Morgan Le Fey used her magic to rise up the sunken continent of Atlantis. Ator and his squad was sent by Chancellor Arcadius to conquer and lay claim to Atlantis for Attilan. Prince Namor the Sub-Mariner ultimately defeated Morgan le Fey and Atlantis sank back to its watery depths, forcing The Crimson Cadre to flee. Ator was next seen in an adventure where he and his Crimson Cadre were taken under the spell of Maximus in yet another of his schemes to win the throne from his brother. Quicksilver and the Knights of Wundergor interceded and defeated Maximus, freeing Ator from the mind control. It remains unclear if the Crimson Cadre is still an active program within the Attilan military. Ator has not been shown in a while and his fate following the fall of Attilan during the Infinity Event remains unknown. An Inhuman lieutenant in the internal security force of Attilan. Auran had yellow skin, brown hair and large, rabbit-like ears. These ears bestowed her super hearing as well as the ability to pinpoint the origin of a specific sound over a great radiance. Quran additionally possessed augmented speed and dexterity. Auran was one of the last remaining members of the internal security force following the fall of Attilan during The infinity Event. She patrolled the streets of New Attilan and focused on putting down a criminal enterprise where unscrupulous Inhumans were selling counterfeit Terrigen Crystals to desperate parents who were worried that their children would be denied a proper Terrignesis. To help her on this case, Auran recruited a NuHuman named Frank McGee (Nur) who had been a former detective for the New York Police Department (but had been forced into early retirement after his transformation into an Inhuman). Auran and her new partner were summed by Queen Medusa and tasked with discovering the whereabouts of her missing husband, Black Bolt. Auran used her special hearing abilities to track down Maximus in Manhattan. Before they could apprehend him, however, Maximus used his mind control over Black Bolt to unleash a devastating attack. Auran perished saving her new partner, pushing him out of the way and shielding his body from the brunt of the attack. Auran is survived by her twin daughters, whom her former partner, Nur, has dedicated himself to looking after. Aven is an elder Inhuman and master of the treasury. He was charged with being responsible for taking care of the royal scepter inside the royal treasury. At one point during his service, Aven is struck from behind by an assailant who possessed great speed. The scepter was stolen and Aven described the thief as a speedster who appeared as a blue streak. The description led Gorgon and Karnak to assume that the culprit was Quicksilver. 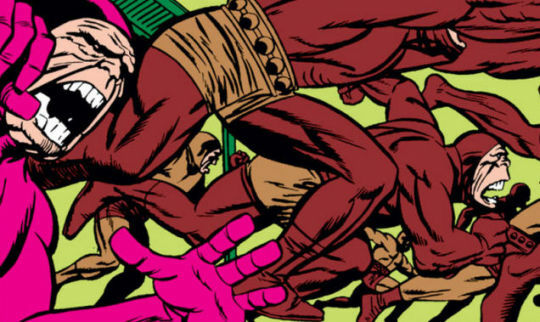 Quicksilver was confronted by Gorgon and Karnak but used his speed to evade them. Quicksilver ultimately led his pursuers to the actual culprit, Aireo. Aireo (a renegade Inhuman and former coconspirator of Maximus the Mad) had stolen the scepter so to sell it on the black market. In an effort to avoid capture, Aireo threw the scepter out a window. Quicksilver used his awesome speed to run out and catch the scepter before it could smash against the ground. The scepter was later returned to the treasury and remained under Aven’s guard. Aven’s whereabouts following the fall of Attilan during the Infinity Event remains unknown. Avia: An Inhuman with greenish-blue skin and bird-like features. Avia was a high-ranking member of the Genetic Council during the course of the ‘Silent War’ event where Attilan and the United States fought over a stolen cache of Terrigen Crystals. Avia maintained a hawkish outlook on relations with the human government. Later, Avia ascended to the role of the chancellor of the genetic council, taking the seat vacated by Carthus. Avia maintained this role during a time when Black Bolt’s brother, Maximus, had once more succeeded in deposing his brother and taking the throne for himself. Ruling proved to be a good deal less exciting than Maximus thought it would be and he found himself hopelessly bored as he listened to Avia issue forth the governing matters of the day. Avia proved to be the last chancellor of the Genetic Council. Maximus ordered the council dissolved in the midst of the Secret Invasion Event, decreeing that there was no way to determine whom among the council might be a Skrull imposter. Later, when Black Bolt returned and took on the role of the Midnight King and Lord of the Universal Inhumans, he chose not to reinstate the council. Since the establishment of New Attilan under Queen Medusa’s rule, a new council yet to be formed and Avia’s status and current whereabouts remain unknown. An Inhuman youth who was injured by a group of Kree refugees who were seeking asylum in Attilan during the time that the city was located on the blue area of the moon. Avia was discovered by the guardsman, Krush, who rescued her and brought to healers within the city. Avia was not shown again, but it is presumed that the healers were able to treat her injuries and she made a full recovery. Her current status and whereabouts remain unknown. Avadar: An Inhuman scientist and geneticist who lived on Attilan centuries ago. The process of cloning was strictly banned and forbidden under the laws of the Inhuman Genetics Council. Yet Avadar was able to persuade The Council to override this law due to the overwhelming need for a manual labor force on Attilan. The Inhumans had benefited greatly from advances in their technology. The various machines and mechanisms that powered the city, however, required a great deal of maintenance, repair and operation. The citizens of Attilan had grown accustomed to luxury and there came to be an ever-growing shortage of laborers willing to toil in the bowls of the city. The Alpha Primitives were cloned as asexual with a dedication to the maintenance of Attilan essentially bred into their consciousness. They proved an ideal and diligent workforce, laboring for three quarters of the day, slept the remaining hours, and possessing no need for leisure or culture (other than a quasi-religious dedication to care and maintenance of Attilan). Avadar’s creation of the Alpha Primitives was viewed as a great success and he lived out his days as a figure of high renown. Centuries past and most of Inhuman society paid little mind to slave race toiling endlessly below their city. It has only been in recent generations that the citizens of Attilan began to feel a sense of guilt over the matter. At one point, Maximus created a bizarre machine that harnessed this mounting sense of guilt among the Inhumans over their use of slaves and used it to fuel a giant robot. The robot attacked Attilan and it was only with the aid of the Fantastic Four that the Royal Family was able to discover the truth about the android’s energy source and subsequently defeat it. Shortly thereafter, Black Bolt issued a royal decree abolishing slavery on Attilan. Freedom was a foreign concept to these beings whose entire purpose was dedication to the ‘great machine’ (i.e. the City of Attilan). The Alpha Primitives accepted King Black Bolt’s offer of freedom under the condition that they be left alone to tend to their work. No new clones were made and the younger Alphas mutated to develop secondary sexual characteristics and the ability to reproduce on their own. All this made Black Bolt very unpopular among the ruling class of Attilan. The Genetic Council was especially concerned over what might happen were the Alpha Primitives to reproduce in greater numbers, overwhelming the space available in subterranean Attilan. Black Bolt discarded these concerns; The Inhumans had benefited for centuries as a slave state and now they would have to simply accept the consequences of what might happen in the future. Since then, a tenuous peace and balance has maintained between the Alpha Primitives and The Inhumans. The Alpha Primitives were banished to the Negative Zone by Ronan The Accuser during the time that he had temporarily conquered Attilan and what has become of them there remains unknown. A small handful of them remained behind and relocated with Attilan to the Kree world of Kon-Tar. These remaining Alpha Primitives had their minds controlled by Maximus and attacked Crystal and her them-husband, Ronan the Accuser. New Alpha Primitives were later created by the renegade despot, The Unspoken, who used Xerogen Crystals to devolve a group of humans into Alpha Primitives. Hank Pym’s Mighty Avengers were able to assist in defeating The Unspoken and most of these new Alpha Primitives were transformed back into their human state. The remaining Alpha Primitives who lived on Attilan during the fall of the city in the midst of the Infinity Event were evacuated through the Door of Eldrac. Their current whereabouts remain unknown. While these Alpha Primitives are welcome to return to the newly established New Attilan in The Hudson Bay, it appears that Queen Medusa is not looking to re-attain slave laborers to support the maintenance of the city. Avius: A winged Inhuman with bird-like features and purplish plumage. Avious served in the royal guard and patrolled the skies over Attilan. At one point, Avius and his fellow winged sentries came across the Human Torch of the Fantastic Four, who had come to Attilan uninvited. Avius and the others engaged The Torch in battle. Avius’ laser gun was melted by one of The Torch’s fire blasts, but Avius’ colleague, Pinyon, was able to fire off a stun ray that rendered The Torch defeated. Later, Avius was among Stallior’s security force when they battled The Fantastic Four in New York. He has an identical twin brother named Pinius who has also been transformed into a bird-like being via Terrigenesis. Avius and Pinuis wear similar fatigues and it is near impossible to tell to two apart; they have both served in the Royal Guard. Avius and Pinius’ current whereabouts following the fall of Attilan during the Infinity Event remain unknown. The current Queen of the Dire Wraiths and ceremonial bride of Black Bolt. Avoe is a Universal Inhuman, one of a number of different alien species whom the Kree had subjected to the same Terrigenic experiments as Earth’s Inhumans. As part of a Celestial Prophecy, the regents of these diverse cosmic Inhumans came together and chose Black Bolt as their king and leader. This marriage between Black Bolt and his Universal brides was strictly ceremonial and not a matter that was consummated (or at least I hope that was the case). Black Bolt disbanded The Court of The Universal Inhumans once the Kree were defeated and their invasion of Earth repelled. The marriage between Black Bolt and Avoe was annulled and she and her fellow queens returned to their respective home-worlds to govern over their peoples. A young Inhuman with green skin and purple hair, with a bright yellow streak through the crest of her hair. Ayram was very excited to attend the royal wedding of Black Bolt and Medusa. This was Ayram’s sole appearance and her current whereabouts remain unknown. The daughter of Kobar and La, the sister of Ambur, and aunt to Queen Medusa. Azur married Mander and together they had two sons, Triton and Karnak. Both Azur and her husband came from prestigious families on Attilan and were considered to have excellent bloodlines. It was expected that Terrigenesis would endow both their sons with fortunate gifts. When their elder son, Triton, was exposed to the Terrigen Mists, however, he was transformed into a fishlike humanoid who required a water-based atmosphere to breath. Although Triton would ultimately prove a greatly respected member of the Royal Family, his transformation was initially viewed as freakish and a source of great shame for his parents. So dismayed was Azur over Triton’s transformation that she chose not to have her younger son, Karnak, exposed to the Terrigen Mists. Instead, Karnak went off to study with a sect of gnostic monks who taught him philosophy, spirituality, as well as the mystical form of martial arts that enables him to decree the fault in all things. Azur’s fate remains yet to be told; whether or not she is still alive and her current whereabouts remain unknown. An Inhuman who was born centuries ago and posed as a Mayan god as a member of the Mayanpan. These Mayapan were a group of Mayans who had wondered off to a secluded section of the countryside where they had come upon a spring that was connected to a subterranean cache of Terrigen Crystals. Exposure to the Terrigen caused a few of these individuals to undergo Terrigenesis. With their newfound powers, these Inhumans took over the Mayan Empire and demanded that that be worshiped as gods. The Mayan people eventually rebelled against these Inhuman overlords and somehow managed to defeat and destroy them. Ixchel, the last surviving member of these Inhumans, fled into an astral realm along with the disembodied life essences of Ah Puch and their fellow Mayapan. She remained there in stasis for over a thousand years until she was awoken by a fissure cracked into the astral realm, accidentally created by the super-beings, She-Hulk and A-Bomb. Released, Ixchel manifested a giant ziggurat in the middle of the Canadian Rockies. She drained the life-force from She-Hulk, Lyra, and A-Bomb, using the energies to reincarnate Ah Puch and the others. Ah Puch took on the guise of the Mayan god of death. He possesses the capacity to drain and re-channel the life-force energies of others.